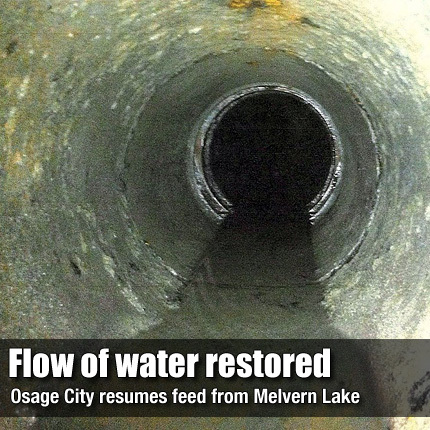 The pipe Osage City uses to draw water from Melvern Lake was drained and then flushed last month after being completely blocked by zebra mussels. OSAGE CITY—About two and a half months after zebra mussels plugged Osage City’s main water supply line, the city is again using water from Melvern Lake. Mike Gilliland, Osage City’s utility director, reported at last week’s council meeting the line had been sufficiently cleared to allow water to be pumped from the lake, but the change back to using Melvern Lake instead of the city lake was necessary before the crew was ready. Problems with the pump at the city lake, which were still undetermined as of Tuesday, forced the city to begin using Melvern Lake again on July 10. Although flushing the main pipeline had not been completed, workers were almost finished with the process. At the first of May, the Melvern Lake pipeline had a drop in pressure at the city water plant. Initially a leak was suspected, but subsequent investigation revealed zebra mussels had plugged the line. Mussels were also found inside of the water plant in several valves. At a June council meeting, the city contracted engineering firm Burns and McDonnell to begin a two-phase plan of action to investigate and alleviate the problem, with the first phase having an estimated cost of $80,000. Gilliland said this week the first phase of the project was nearing completion, with the final step being to flush the line of dead mussels. Although the process was not quite finished, Gilliland said no problems have occurred since the Melvern Lake pipeline was turned back on.